Western Front is hosting a “prospective retrospective” for Instant Coffee, a collective of contemporary artists who focus on service-oriented art. The idea is that the real difference between instant and regular coffee is taste, and tastes change. After all, both deliver caffeine, but instant coffee is just a bit faster and easier to make: it’s cheap but effective. I’m not going to try to describe the work- it’s better to just show you some of my photos, along with the video provided by Instant Coffee. As the artists say, “it doesn’t have to be good to be meaningful”. Enjoy. Feeling So Much Yet Doing So Little from Instant Coffee on Vimeo. 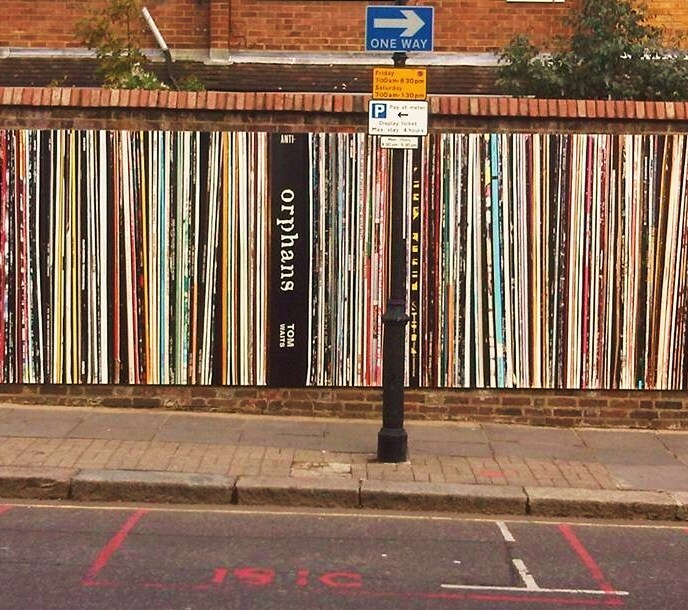 The Portobello ReCollection transformed a 100-meter brick wall into a giant record collection. Nearby residents were polled on their favorite albums, which would be included in the installation. I was thrilled to see that Tom Waits’ Orphans: Brawlers, Bawlers & Bastards made the cut. Since it’s a triple album, it takes up lots of space. Nice. Portobello ReCollection is the work of Natasha Mason and Teresa Crawley. Yin Xiuzhen has created miniature cities in open suitcases, using discarded clothing and other found materials. These textile sculptures are called, fittingly enough, Portable Cities. Her current exhibition (at the Anna Schwartz Gallery in Sydney) features Melbourne, Shenzhen and Jia Yu Guan. Looking at Mini-Melbourne, we can see that Yin cleverly rendered Flinders Street Station, the MCG and other notable landmarks. (Having never been to Shenzhen or Jia Yu Guan, I can’t comment on their veracity, but they sure look cool). Yin spends time in each place and the buildings chosen for re-creation are ones that she finds memorable. It provides an interesting view of the locations and enforces her key message; you cannot truly understand, and therefore learn from an environment, unless you spend a good amount of time there. 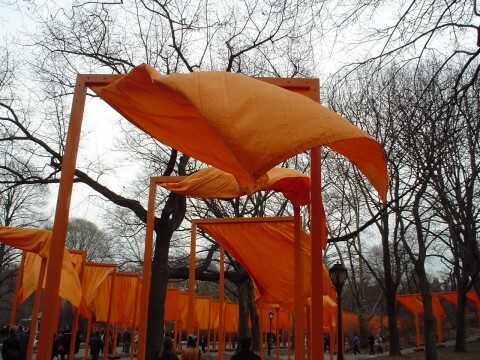 If you’ve seen the recent AT&T ad, you’ve probably noticed the remarkable resemblance of those orange-draped landmarks to the Christo and Jeanne-Claude installation The Gates, which stood in NYC’s Central Park. You be the judge: here’s the ad, and below that is a photo of The Gates, which I took in February 2005.